SET Financial is committed to helping our customers better manage their personal finances and what better way to do that than use software built specifically for that task? This article is part of a series to help you learn about mobile apps we have found that you may find useful for budgeting. We all struggle with managing our money. Things always come up like repairs for your home or car, mounting credit card bills, kid’s school events and more. The list goes on and never stops, doesn’t it? But you don’t have to be a victim to money. You can take charge and be the master of your money rather than the other way around. If you are even moderately computer savvy, budgeting software, and specifically mobile apps, can be of great use for budgeting your finances. Let’s take a look at one such software tool – You Need a Budget (YNAB) and how it may be able to help you stop living paycheck to paycheck! ‘Give every dollar a job’ means you basically take your money you currently have in hand (checking account or cash) and assign to spending categories. Think of this rule as putting money in envelopes (groceries, gas, credit card, rent, etc). ‘Save for a rainy day’ means you need to take some cash you have and budget for those unexpected things we talked about – car repair, home repairs, medical expenses, etc). You are putting some cash/money into ‘electronic’ envelopes for those rainy day items. ‘Roll with the punches’ means you will always be making adjustments to your budgets/envelopes. Things come up… Always! So chill out, don’t worry. Just make adjustments and move money around in the envelopes. If your car breaks down and you don’t have enough money in that budget category (‘envelope’), then take some from groceries or your home maintenance category. Life is fluid, roll it with! ‘Live off last month’s income’ is the be all to end all rule. It’s the one you want to achieve to be a true budgeting jedi. This means you have rolled over enough of your envelopes from the prior months that you have enough cash reserves in your checking account to live without even tapping into this month’s paychecks. It means you didn’t spend all the money in those various envelopes (whatever you don’t spend ‘rolls over’ into the next month, just like a real envelope) and when you add it all up, it equals enough money to live on for a month! No more paycheck to paycheck slavery! 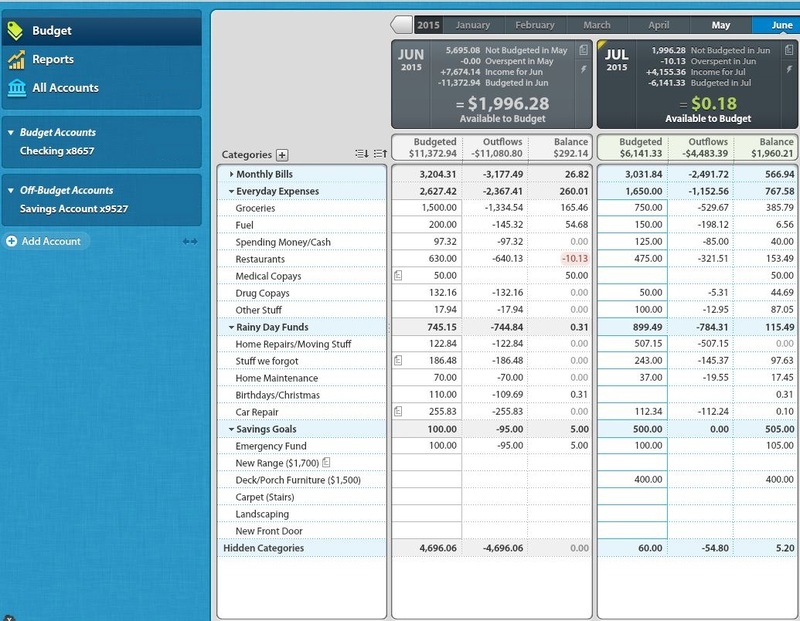 The snapshot below shows you YNAB’s desktop user interface. Budget categories (your “envelopes”) are in rows while the months are in columns. As purchases are made, you assign the purchase to one of the categories you budgeted money for (remember rule #1 right?). Those expenses are displayed in the ‘outflows’ column. The Balance column shows you what you have left in that category. The value is highlighted in red when you have exceeded your budget for that category. You can see that I have set up different “parent” envelopes/categories such as ‘monthly bills’, ‘everyday expenses’ and a set of ‘rainy day’ envelopes. You can set up your envelopes/categories any way you want. What I am showing you here is just an example. Each time you get paid, you ‘fund’ all those envelopes, making sure you have all your bills and every day expenses covered until you get paid again. Any extra goes into those ‘rainy day’ envelopes. There is so much we can cover about this software that we are just getting started. Stay tuned for the follow up article that continues to do a deep dive into YNAB!